How to develop a personal finance forecast. Why do you need one? Completely understand your finances. Plan for the future and use it as a tool for financial decision-making. Welcome! Why I am posting personal finance on a food blog? I wrote this post before I decided to focus mainly on food blogging. I used to be a finance analyst and I’m also an excel geek at heart. 😉 I hope you find it useful. Monthly budgets are really helpful. But I think we all need something more — a forward-looking financial forecast that is always changing as life changes. Speaking of life-changing, creating a personal finance forecast is one of the important steps I took to prepare for my transition from a 9-5 job to working from home. If you missed it, be sure to check out this recent post: Preparing to Work from Home. Gain a better understanding of your finances. Use it as a tool for financial decision-making. Today I am sharing the tools and the process I use. I hope you find it useful too! Here are the tools needed. If you don’t have Microsoft Excel, I recommend getting it! It’s an awesome tool. No matter how hard I tried to get away from using Excel (as a finance analyst) by using other systems, I still used it in some form or fashion because of its functionality. You can purchase a copy from Amazon.com or go directly to the Microsoft website – both should be the same price. Microsoft.com also offers monthly subscriptions at a lower price. Start tracking today and track for 3-4 months. Or go back 3-4 months and document. Most bank and credit card company websites offer the ability to download transaction history by a certain date range. Most should also categorize expenses for you. If not, you may want to look into categorizing using an Excel pivot table, learn how here. 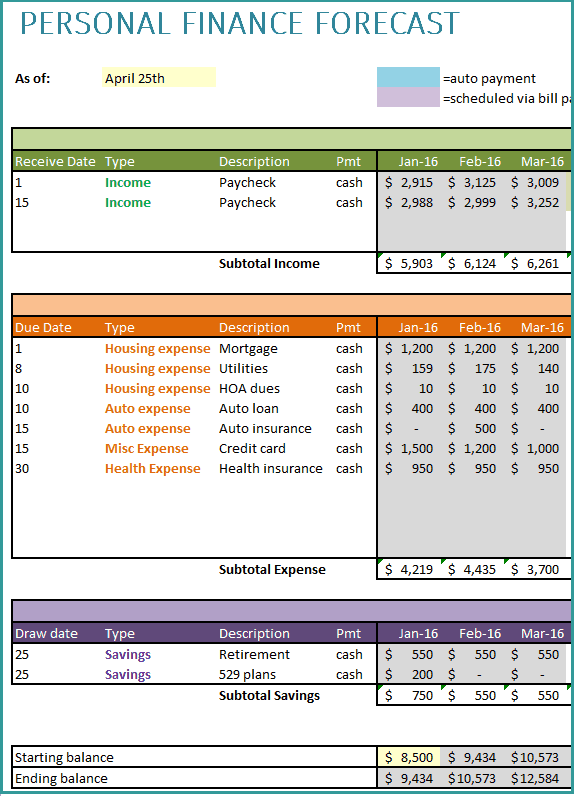 Make sure to track everything by category for income, on-going expenses, discretionary spending, and savings. Customize the descriptions, due dates, and amounts in the template to fit your needs. Please note this example is fictional data. It does not represent my personal (or anyone else’s) data. 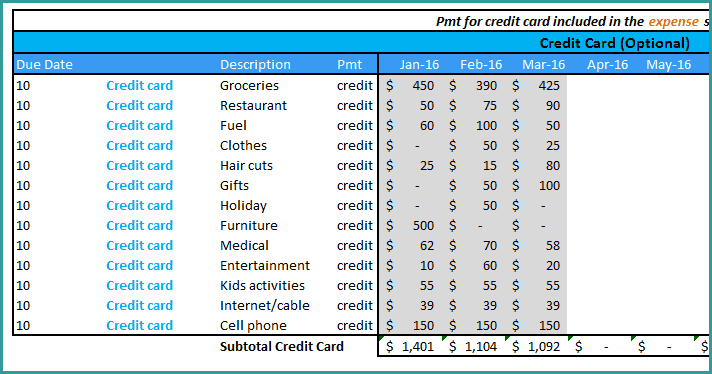 If you use a credit card, I’ve created a credit card section to track spending. (While the cash payment is tracked in the expense section.) Credit cards get a bad rap, but you can use them to your advantage by paying off the balance each month. AND earn rewards in the process such as cash back, airline miles, hotel stays and more. My husband and I use credit cards for all payments unless cash is required. It’s easy to categorize spending and pay one lump sum per month. Please note this example is fictional data. It does not represent my personal (or anyone else’s) data. Once you have completed 3-4 months, take a look at your data. Is there anything that surprises you? I was surprised at how much our family spent at restaurants. We are focusing on eating at home more. (Blogging about food is also encouraging me to cook more!) Are there places you can cut spending? We’ve cut out cable and use on-demand subscriptions instead. Use the financial history you’ve collected, along with any information you have about future months to forecast the remainder of the year. (I’ve also provided the next year in a separate tab if you want to take it further.) For example, we pay auto insurance every six months, so I incorporate that into our plan. I also plan an increase in spending for holidays, birthdays and special events throughout the year. Do this for income, expenses, savings and credit card spending. Here is where budgeting comes in. Once you’ve documented your payment commitments each month, now use the future forecast area to set targets for discretionary spending. The really cool part about this tool is that it provides a longer-term picture of your finances. It’s a decision-making tool. You can start allocating money for the trip you’ve been wanting to make or decide to put even more into retirement. This is a great way to make sure you’re not forgetting a payment. Once the month is complete, review your bank account and other statements to reconcile the month’s data. It’s completely up to you on how detailed you want to get! Each month, once you’ve reconciled how much you spent in each category, you can compare your target to actuals. And then decide how to change your habits moving forward to meet your goals. Continue to track each month. As with any good plan, make adjustments as life changes. The more you track and forecast, the easier it will be. You’ll better understand trends – for example, the trend in utilities due to seasonal changes. And find opportunities for improvement and savings. Try different scenarios. For example, what will happen if you increase your retirement savings? I hope this tool is as helpful to you as it has been for me. I understand it takes time to create and maintain, and it may be a bit overwhelming at first. But getting a good picture of your finances and making improvements is worth the effort! If you have any questions, please contact me. Thanks for stopping by! Please say hi in the comments and let me know if you found any of your data surprising. Will you be making any changes?